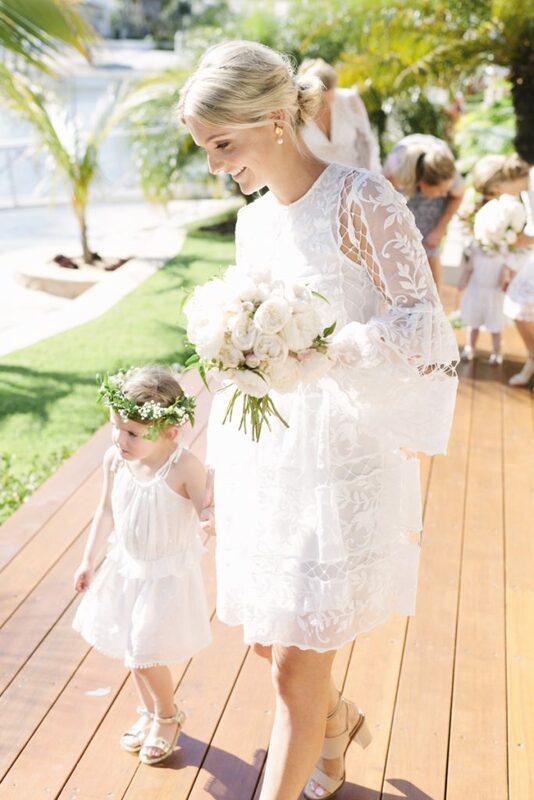 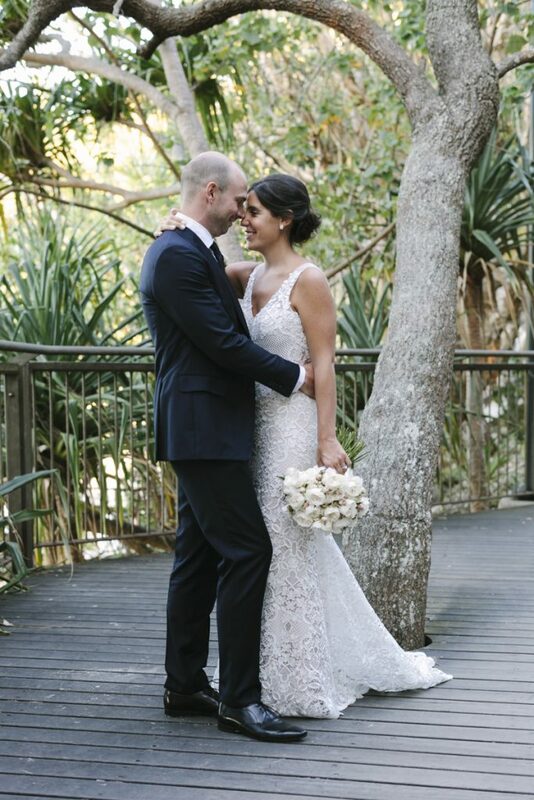 Glamorous coastal Noosa wedding style featured for the stunning wedding of Ebony and Michael, with plenty of beautiful blue skies and gorgeous sunshine featuring for their gorgeous Noosa wedding day . 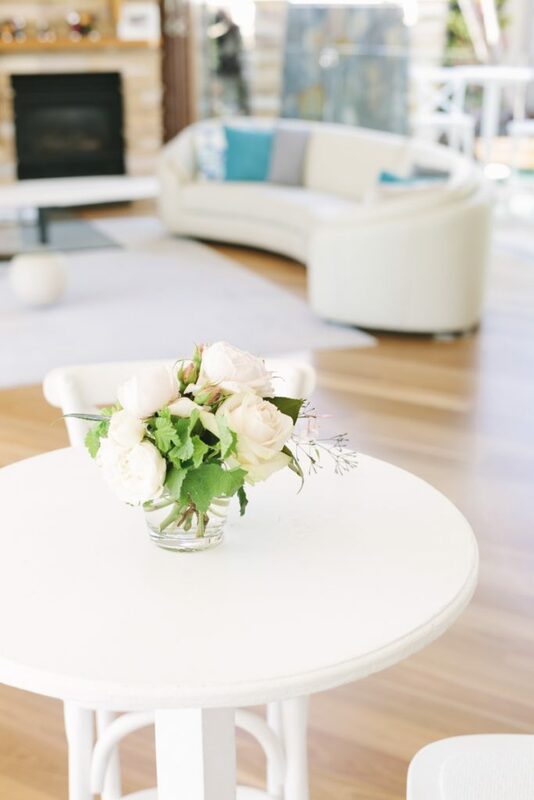 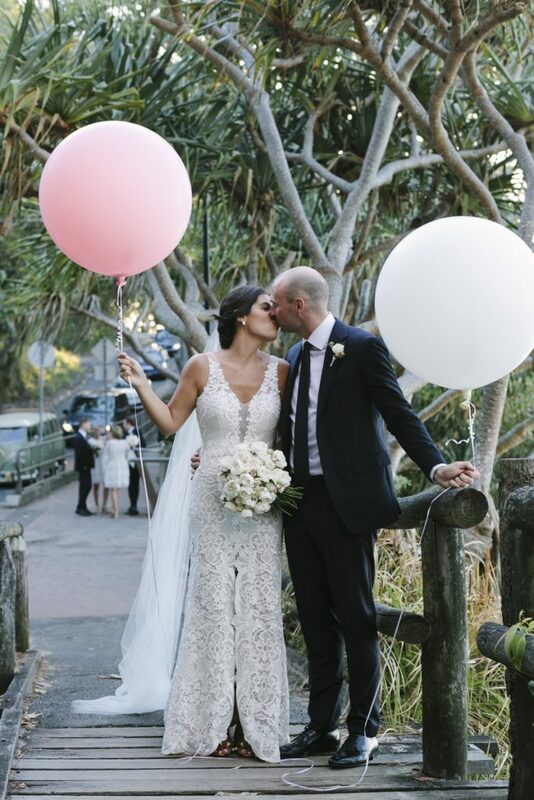 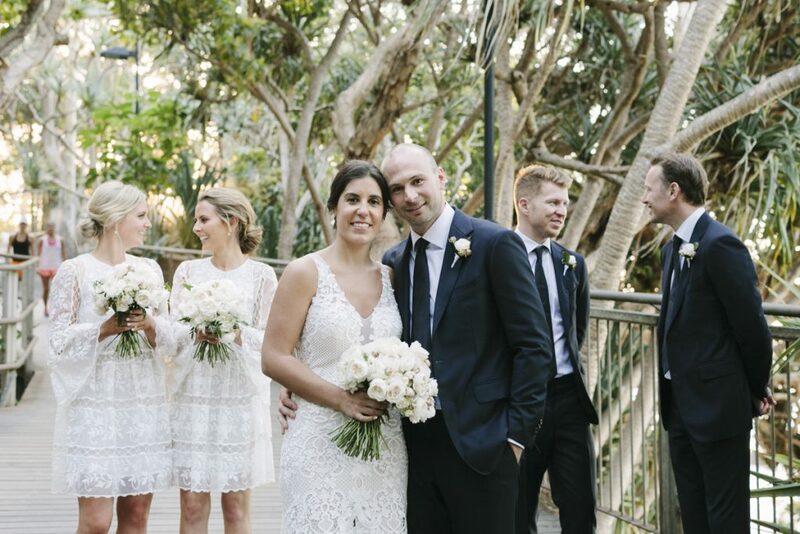 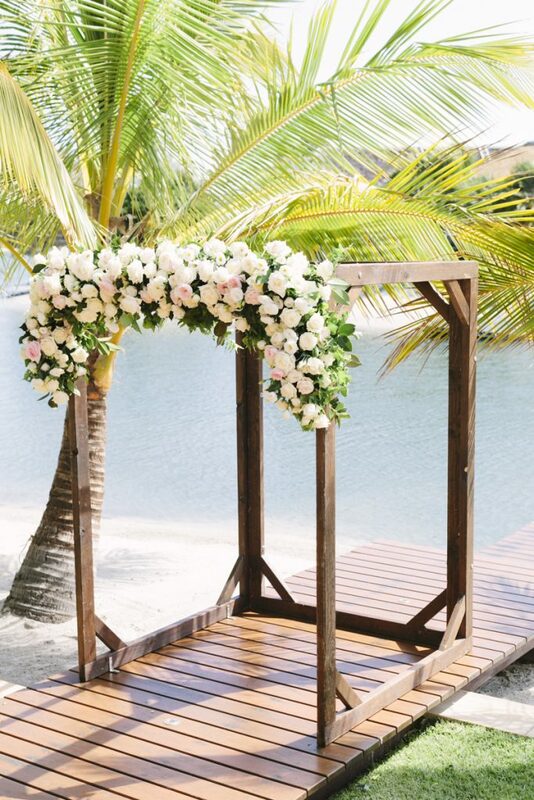 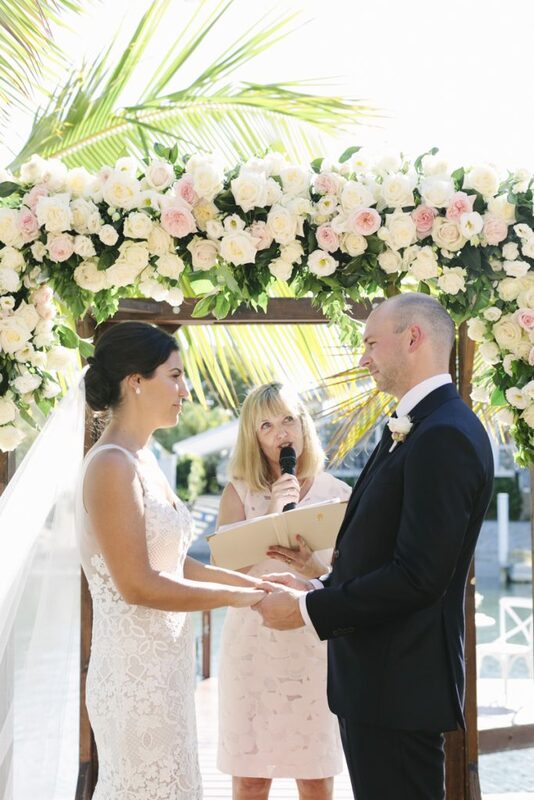 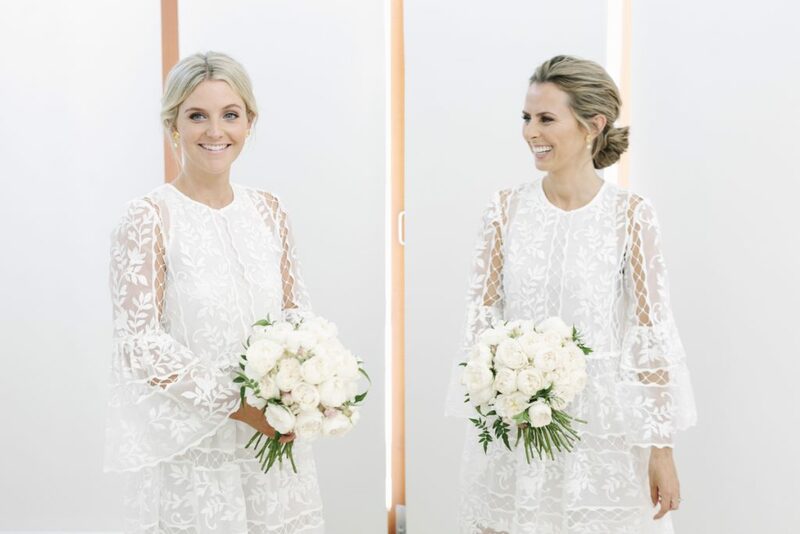 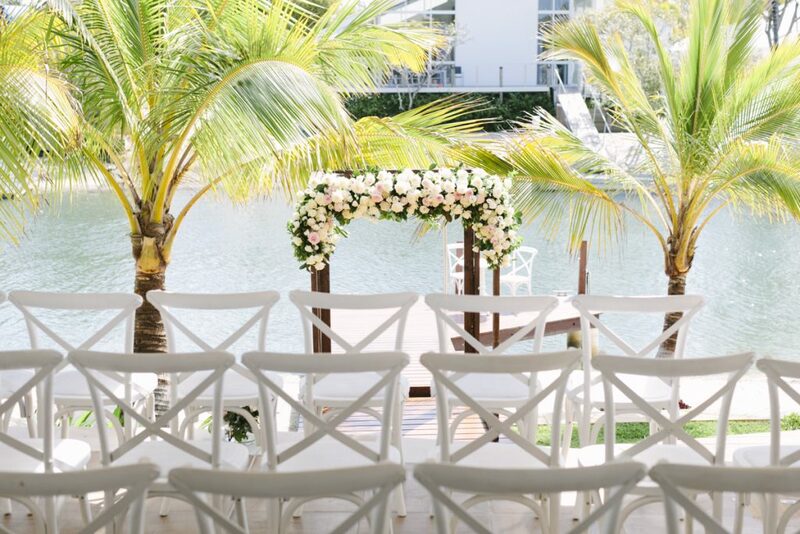 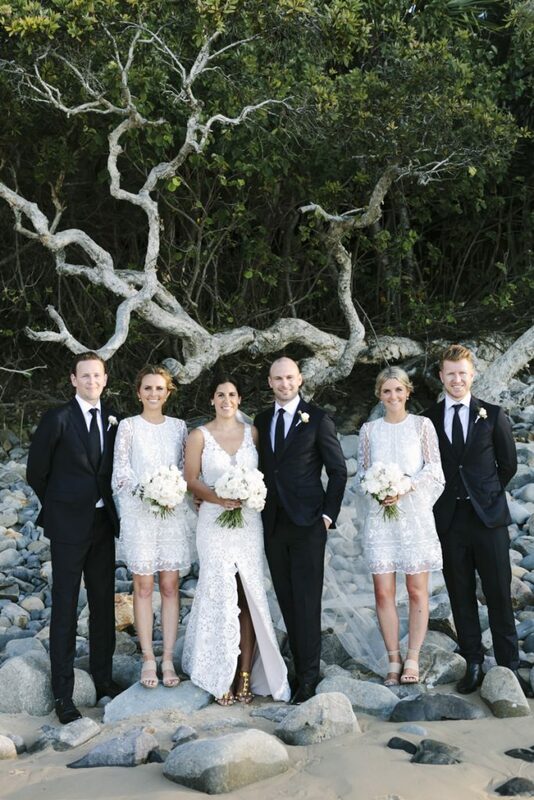 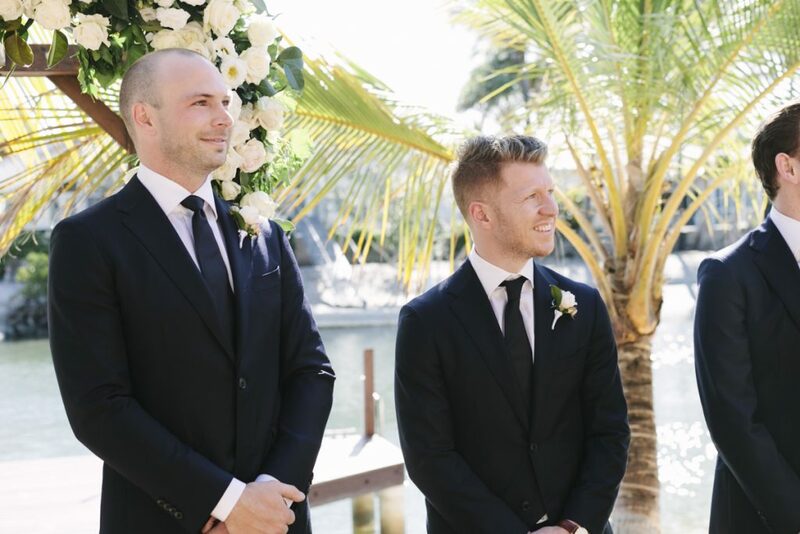 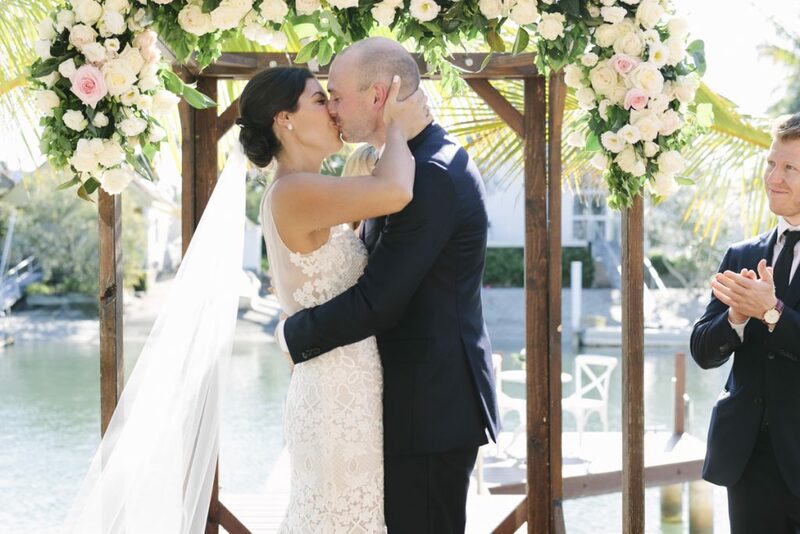 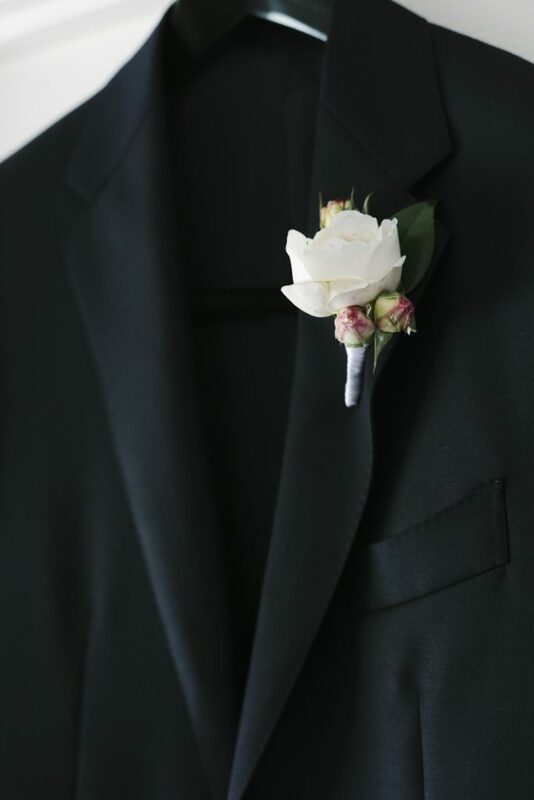 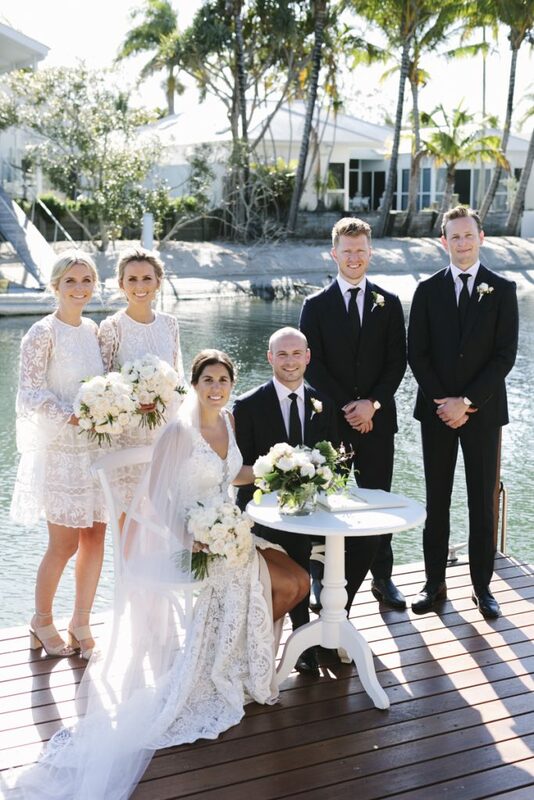 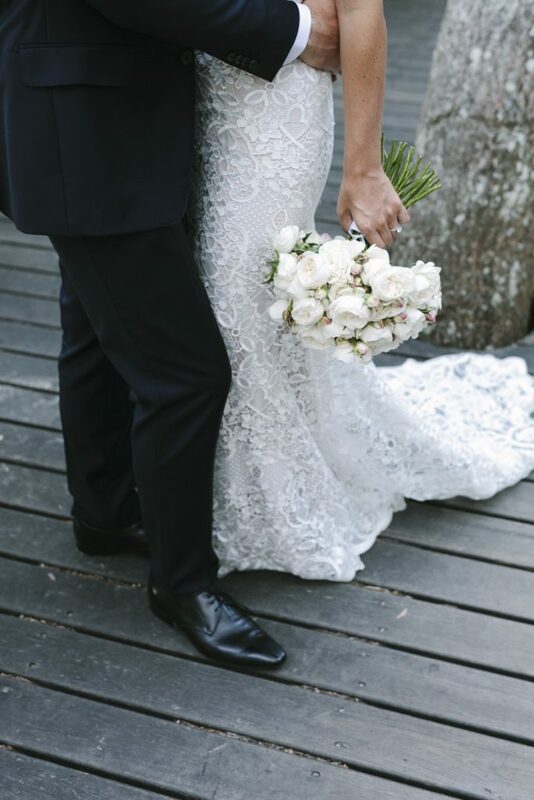 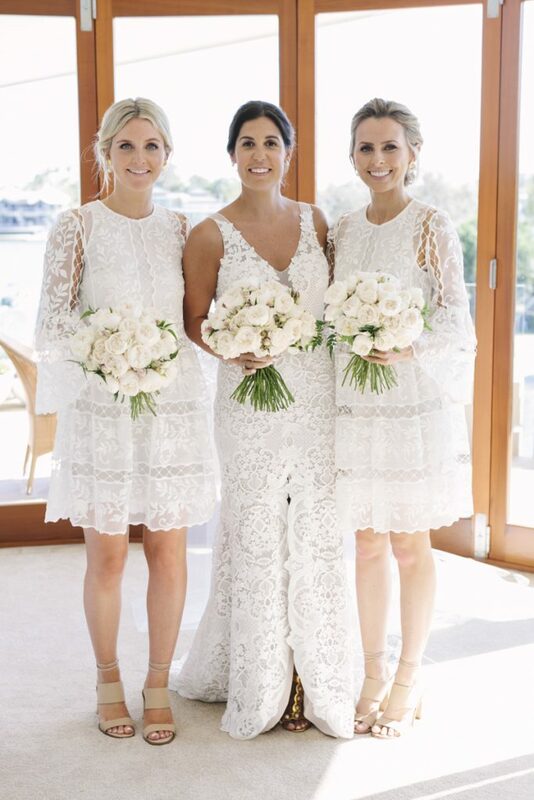 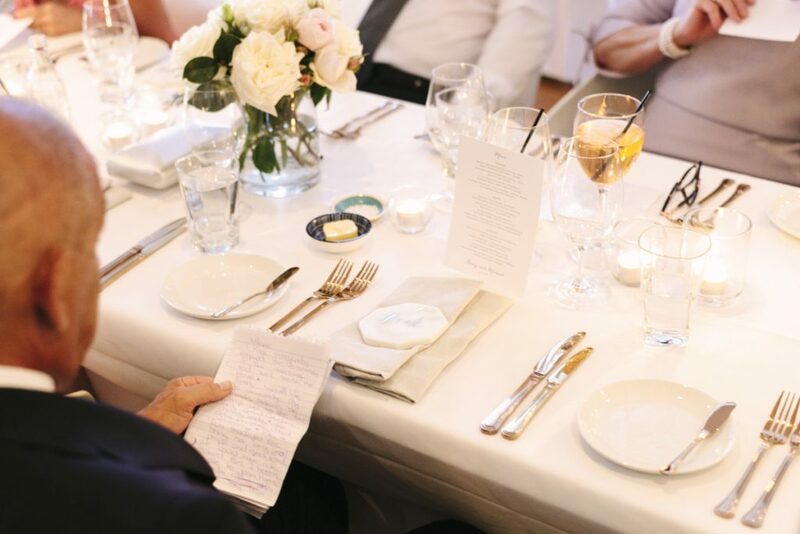 With a colour palette featuring white on white glamour with touches of pastel blush pink Ebony’s floral style was the epitome of modern sophistication with a gorgeous riverside ceremony and a Noosa reception to follow at beautiful Ricky’s Restaurant. 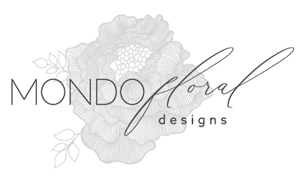 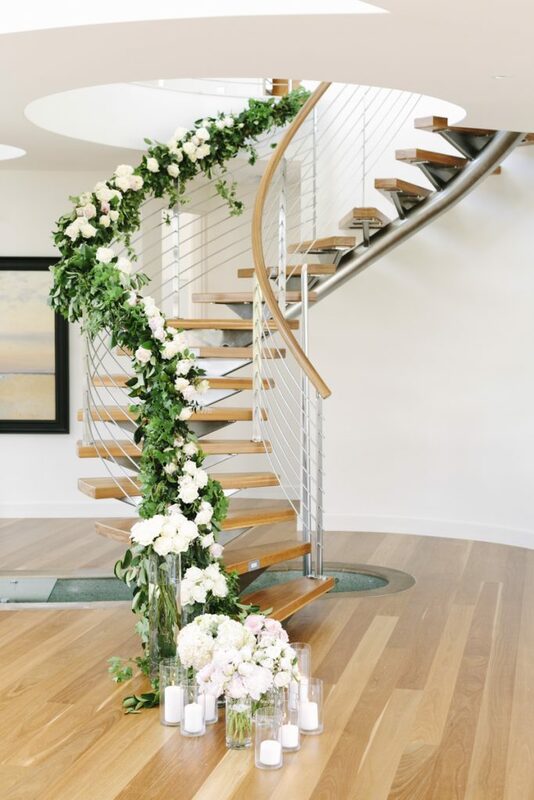 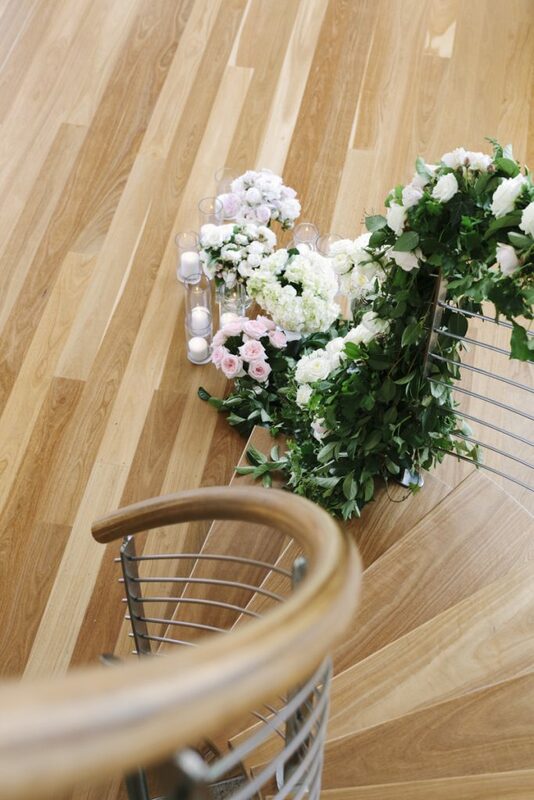 We were placed in charge of creating a floral garland to line the gorgeous staircase rail that Ebony made her grand entrance from, and what a gorgeous feature that became, with lush lovely greenery cascading down the stair rail and also featuring beautiful blooms. 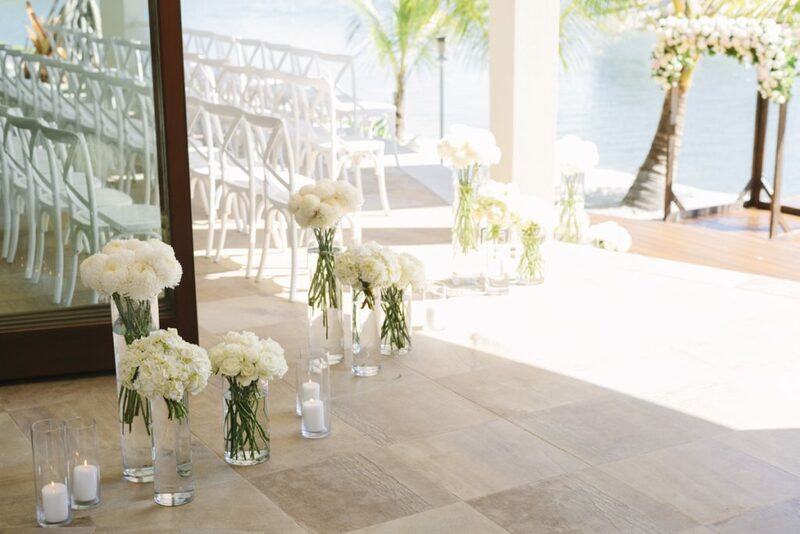 The base of the staircase also featured a cluster of gorgeous glass vases with grouped blooms and leading out to the terrace deck area we created a path of cluster vases that led down to the divine canopy of flowers to meet our gorgeous bride, it was such a feature framing the beautiful blue water and where Ebony’s lovely man Michael stood waiting for her. 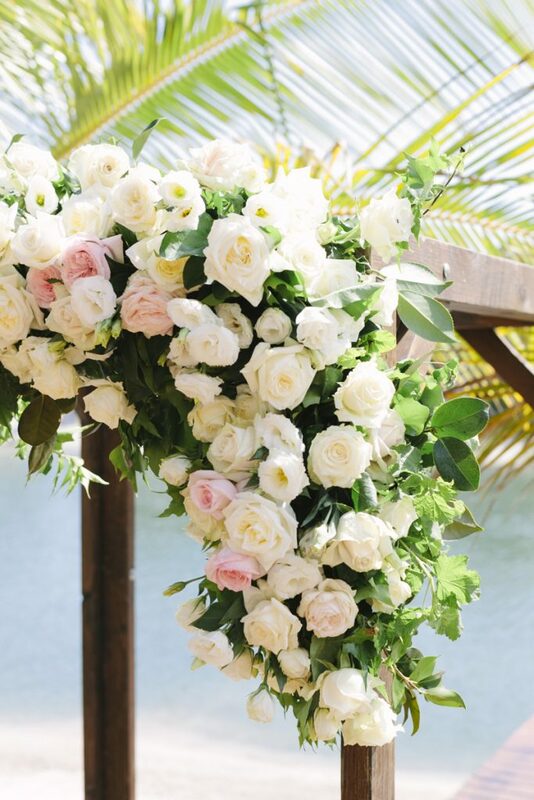 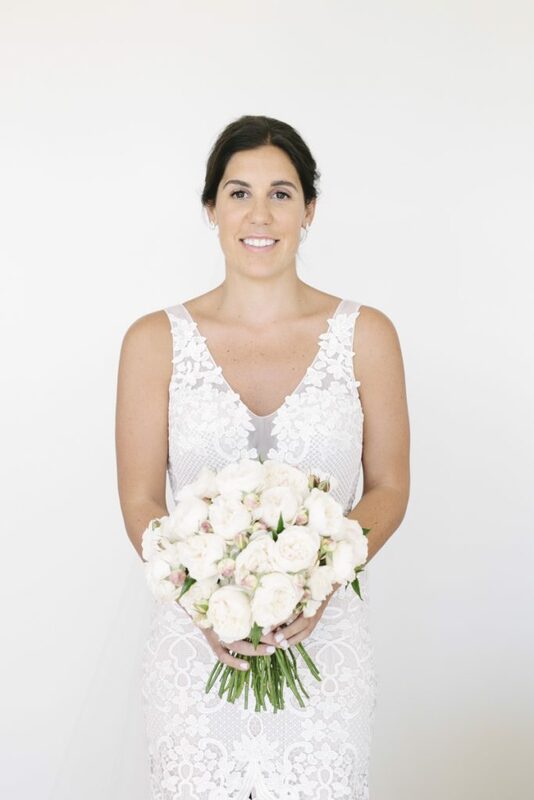 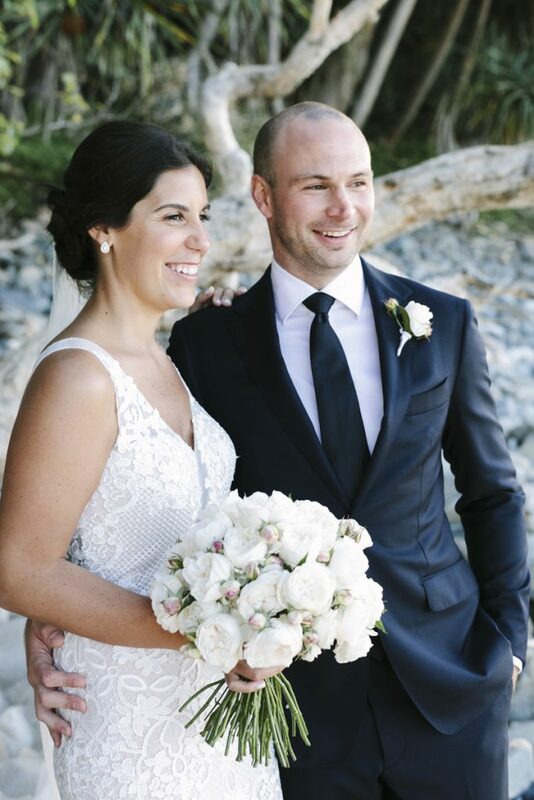 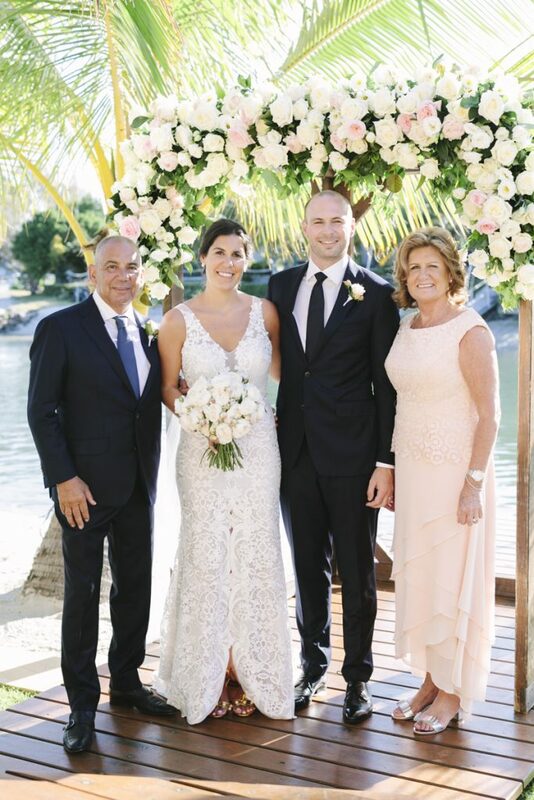 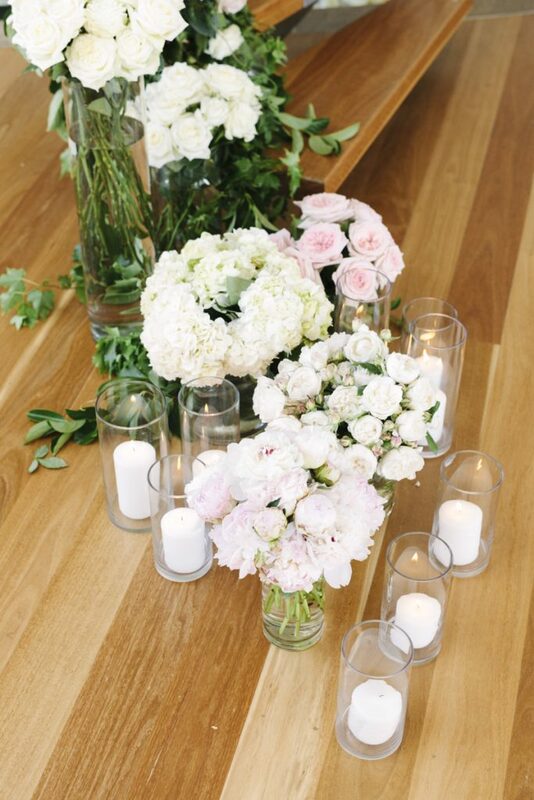 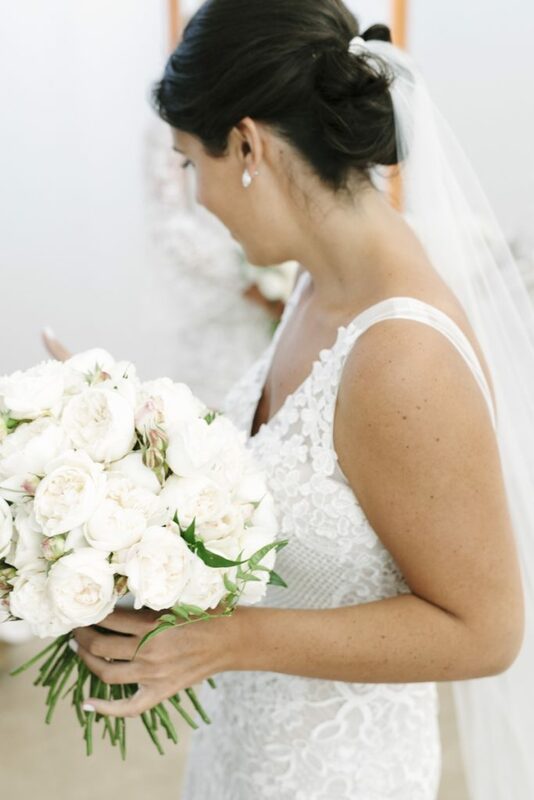 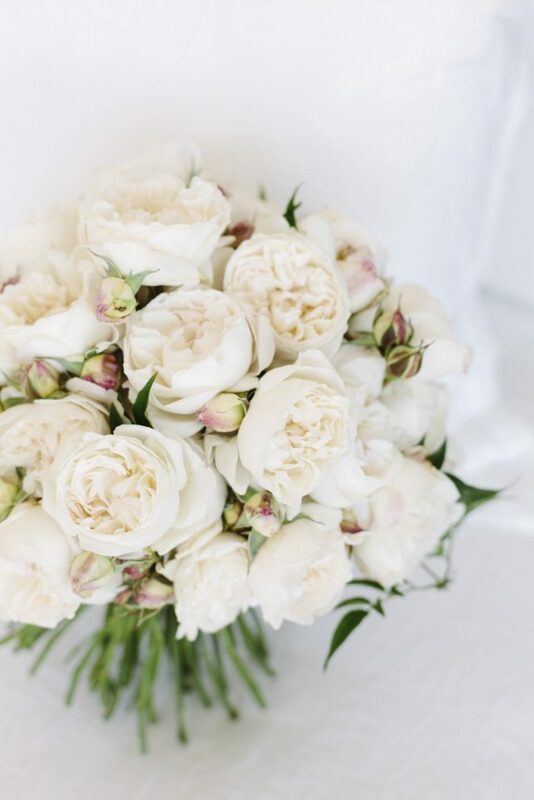 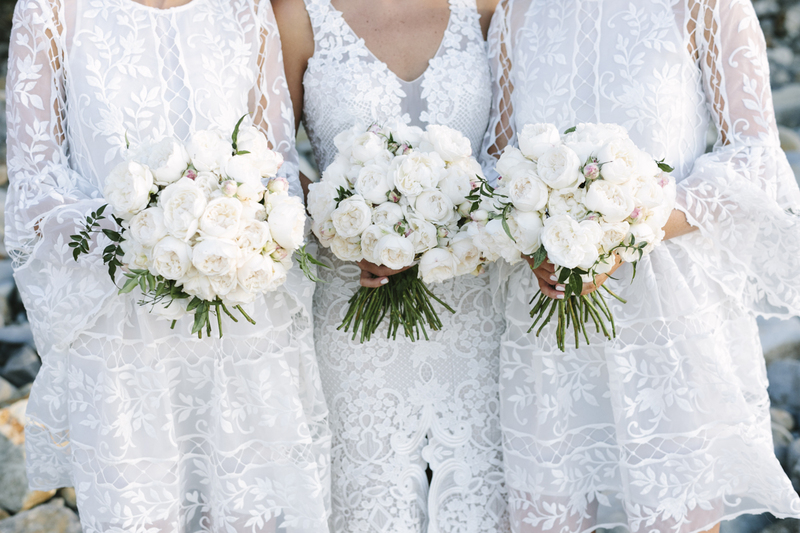 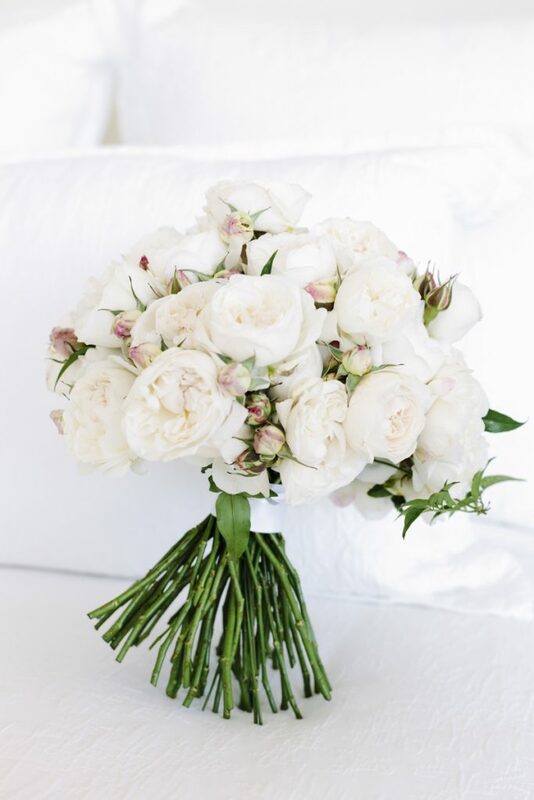 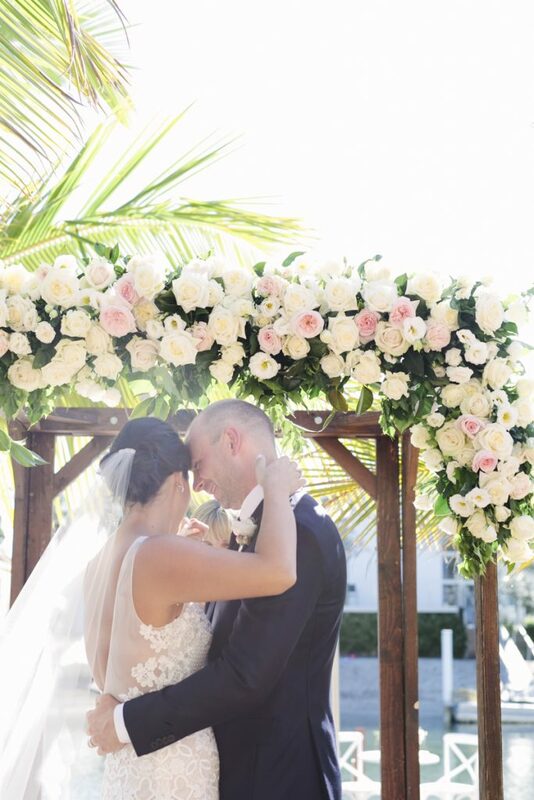 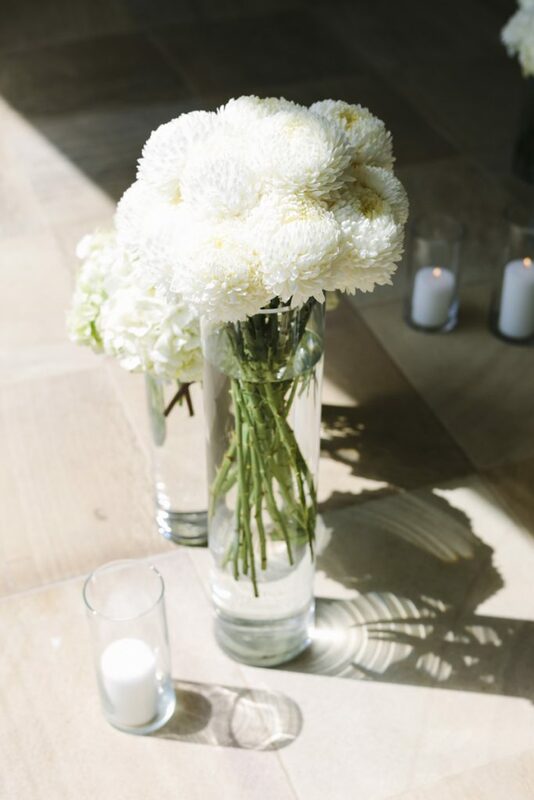 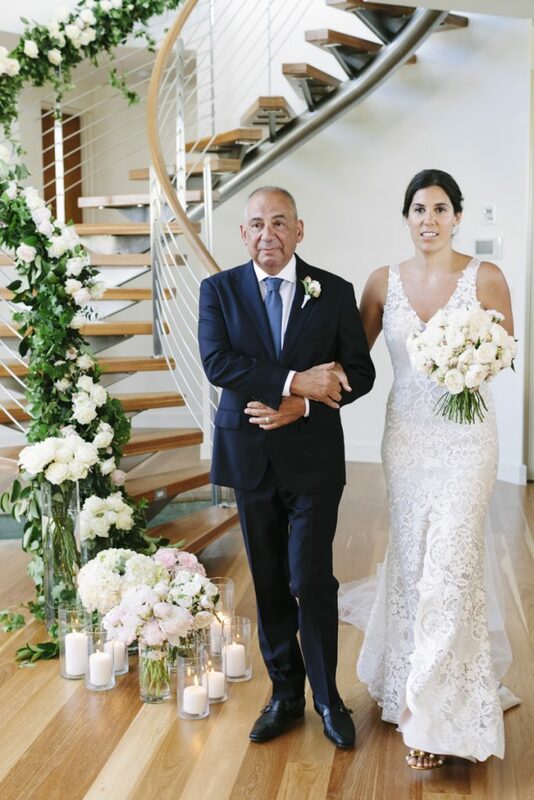 We created bouquets of all David Austin roses for the beautiful bridal flowers and the white on white coastal glamour perfectly accented the stunning ceremony space. 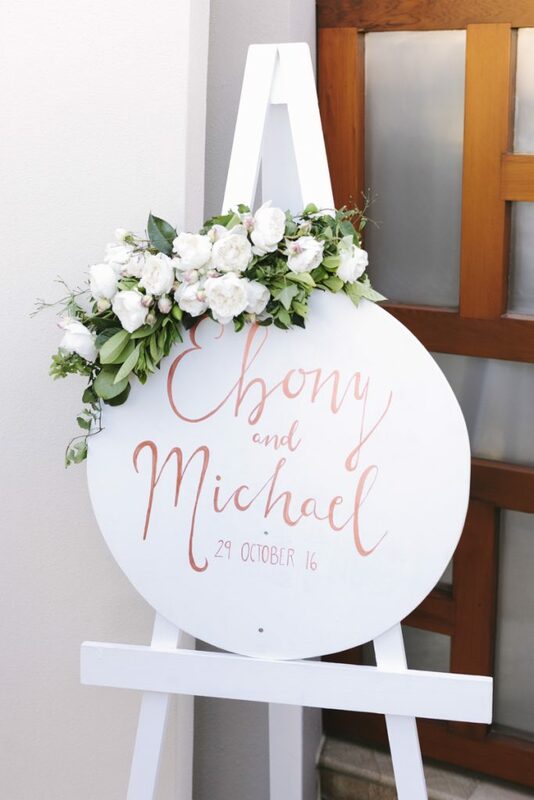 Ricky’s restaurant hosted the lavish reception celebrations and Lovebird Weddings provided the decor and styling for the day. 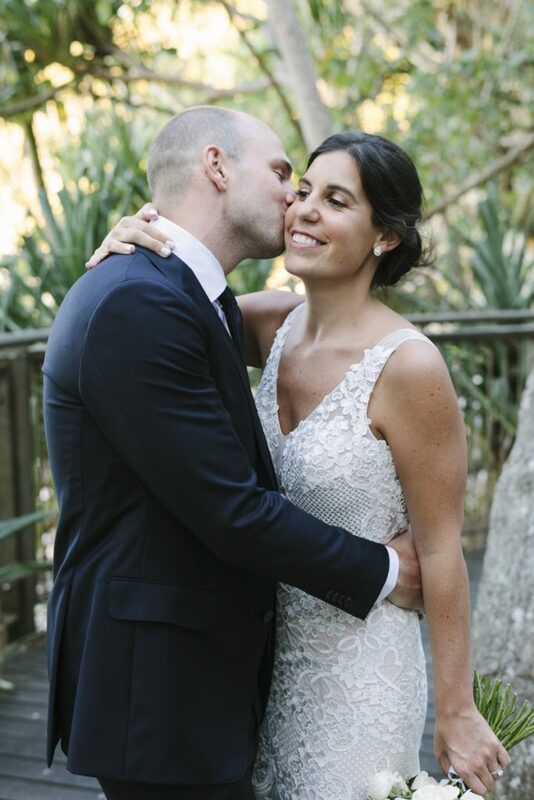 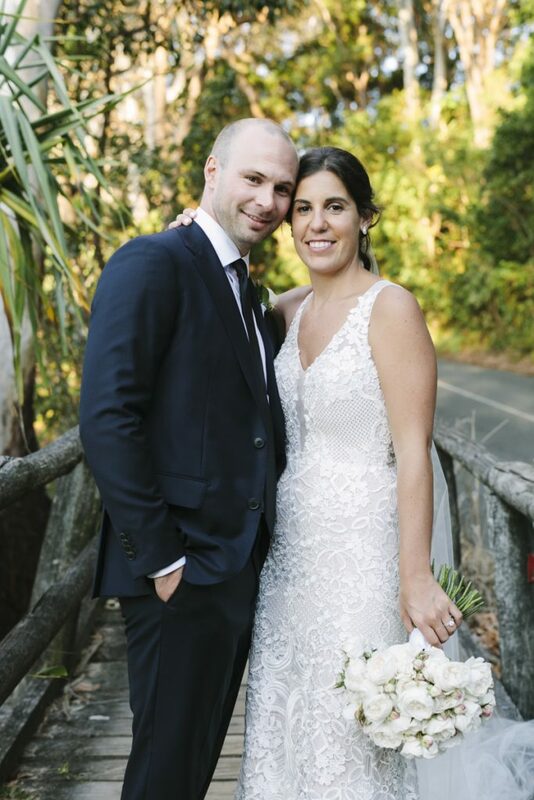 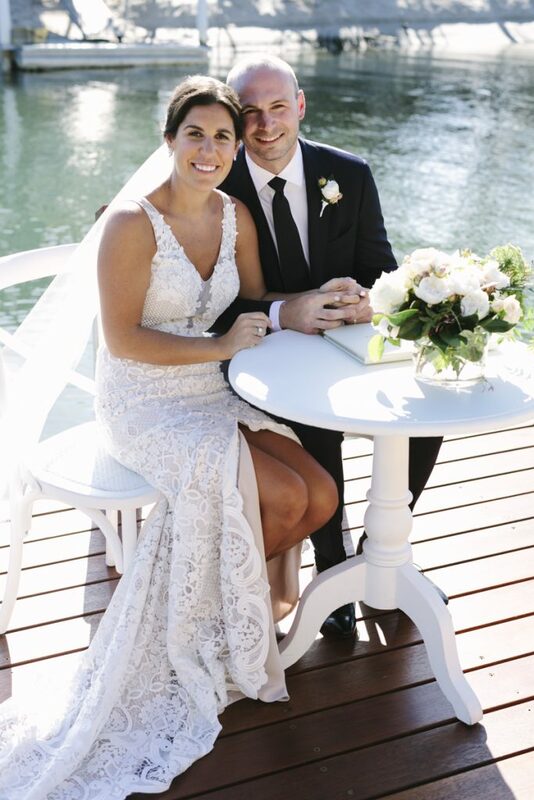 Congratulations Ebony and Michael on your beautiful Noosa wedding day!